A month ago (August 16th) we had our sleeve surgery. The first two weeks were very hard trying to drink every meal, protein drinks tasted gross, I was feeling very weak and tired all the time, depression was hitting me and I was really hating the fact that I wasn’t able to go back to my old ways. I hated going to family gatherings and not able to eat, I missed our old routines of snacking at night or going out to eat at our favorite Mexican food place. About a week after surgery we started trying to eat regular soups, no meats and chew the soft veggies really well and that was very nice but short-lived because I get really sick of eating the same thing day in and day out. But I made it through to the 2 week check up and the doctor said we could advance our eating to pureed foods. Pureed food is gross so we skipped that and just started testing the waters at what we could handle and what we couldn’t. We stuck with softer meats and chewed really good but I feel sick after eating just about everything. Maybe I eat to fast or too much or didn’t chew well but whatever I tried I would get sick. I didn’t throw up, I never have yet but it felt like major reflux and a slight uncomfortable pressure pain and on occasion I just knew I was going to throw up, but I didn’t I fought it and won. I learned that drinking, even just a little, while I ate made it much worse and I learned that I had to stop as soon as I felt food in my stomach which was after a few bites. If I paid close attention I could avoid the discomfort most of the time, sometimes I was still stubborn but I was slowly learning what my body was telling me. I can only eat about 1/4 to 1/2 cup of food and my husband can eat at least twice as much as I can and rarely has any issues at all, which makes me a little resentful and a lot of jealous, especially since he is losing faster than me but I am getting past that too. It takes time to adjust to any new thing and as long as the scale keeps going down I can deal with the learning process. I started getting energy back about the 3rd week probably because I was able to eat food again. We started trying to lift weights and work out, ride our bikes again, take small hikes, just stuff to get us moving again. It felt good to get back to activity. I did stall at week three (which I hear is normal) and was getting very frustrated but that finally passed and I started easing down the scale dial again. We just went to our 1 month post op appointment and doc says everything looks good and we are doing fine advancing our foods like we have so he didn’t need to see us again for 6 months! Yay! I am ready to be done with doctors and just live my life. 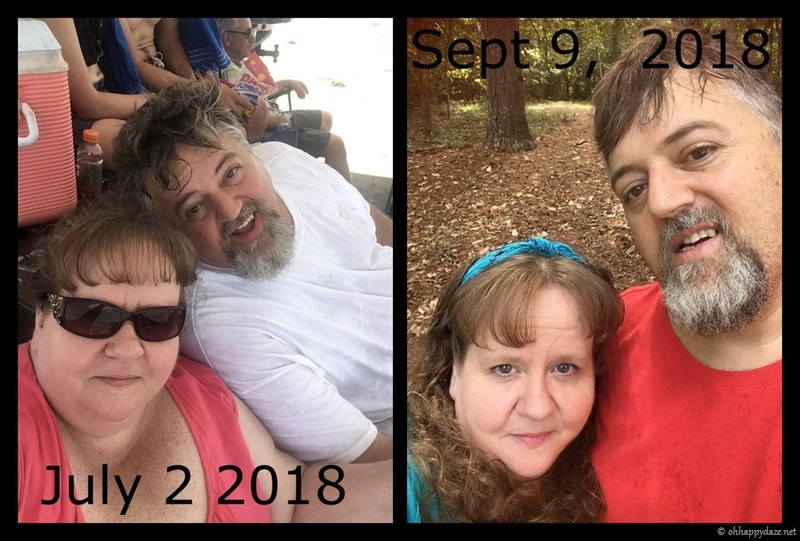 Hubby and I’ve had both lost about 20 pounds since the surgery. I lost 30 on the 3-month pre-surgery diet before that and he lost 50 but he has dealt with two “stalls”. So I guess it has doubled my losing time so to speak. It hasn’t been easy, I honestly think eating right and exercising would have been easier but I didn’t have the willpower or motivation so I had to go this route and use the surgery as a tool. And let me say it really is just a tool to help, I still want to eat stuff I shouldn’t but with the surgery if I eat certain things I get sick and if I eat too much I get sick and you eventually get tired of getting sick and start eating right. That’s why it’s a tool, not a cure-all. I use to think surgery was wimping out and the “easy way” to lose weight, it’s not at all easy! It just won’t let you freely go back to your bad habits. Maybe in time it will feel normal and I’ll get used to the huge change in my life but right now at a month out, nope it’s still hard but slowly it is getting easier. Sure sometimes it’s hard to find stuff to eat that doesn’t make me sick or that I don’t get tired of very quick because I am picky about what I eat. I can’t drink enough fluids or get enough proteins every day like I’m supposed to, I still crave and miss my old foods and my old habits and I’m sick just about every time I eat and sometimes when I drink. I rarely find stuff that tastes good because my tastes have changed and for some weird reason all my liquids seem warmer than they should even when they are ice cold. But I have lost more weight than I ever did on any diet I tried, and that was the point, right? Do I think this was worth it? At this point, I don’t know. I honestly wish I had the willpower to have lost weight the good ol’ fashion way. But I didn’t. So we will see as time goes on if I think this was the right thing for me, guess it doesn’t matter though, there’s no turning back now, I just have to deal with it and adjust. Yesterday was the first time hubby and I got to go out to eat at one of our favorited sit down cafes. We ordered one plate of food and one drink. The waiter looked at us a little surprised, probably because we are still “big people” and we explained we just had surgery and can’t eat but a tiny amount and he was like, “Oh ok that makes sense!” After we were done eating our small portions we asked for a to-go box and the waiter said, “Man! Y ’all weren’t joking about how little y ’all can eat!” I said, “ Sadly no.” He said, “Y ’all come in here a lot I can tell the difference.” I said, “He (Stewart) has lost 75 and I have lost 50, so yeah.” We still tipped the amount we use to tip even though our price for food has changed and 15% would have been like $3 because regardless of how much we spend he was still a good waiter and it isn’t his fault we can’t eat what we used to! On a personal note, one of my biggest pet peeves I have encountered since I started this journey is people telling me that I will be so much happier once I am skinny and I feel like I need to address this faulty idea. Skinny does not equal happiness. Weight is a physical or health issue. Happiness is a mental or emotional issue. I know plenty of skinny people who are very unhappy and plenty of fat people who are super happy. I have had some depressing things happen in my life and being a smaller size does not make those things go away. I may feel healthier and feel like doing more things and one day I may not feel so self-conscious about my weight and may feel like being around people more but just getting skinny will not make a person magically happy so please stop saying that to people, weight loss doe not make all your life’s problems go away, it only makes you physically healthier, while mental or emotional health is a completely different thing. Posted on September 18, 2018, in Family, My Journal, Weight Loss and tagged Sleeve Surgery, Weight Loss. Bookmark the permalink. Leave a comment.